Antiretroviral therapy remains at the forefront of key treatment for HIV infection. Nevertheless the resistance of the virus against drugs involves the development of new drugs acting through novel mechanisms. 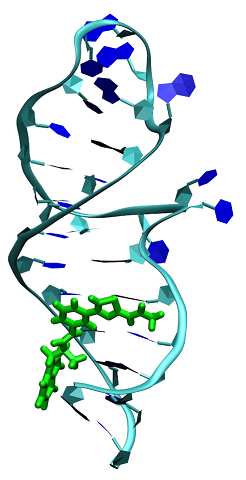 While significant advances have been made with the design of nucleoside analogues which rely on ribose modifications, a recent work showed that 8-isopropylamino-2’-desoxyadénosine, localized in the active site of the enzyme, induced polymerization arrest during DNA/DNA transcription. 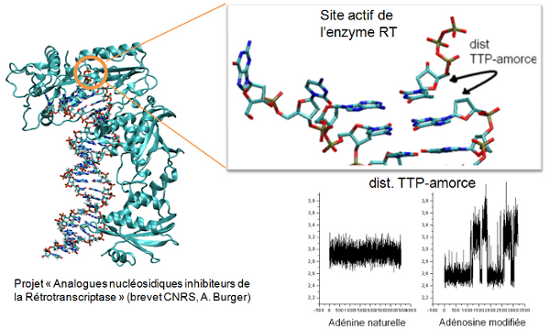 With the help of molecular dynamics simulation we have investigated the structural properties of three molecular models : the experimental structure solved by Huang, and two nucleoside analogues. Calculations suggest that these analogues structures have intra-nucleoside sugar-to-base hydrogen bond (N8-H...O5’). By comparing base pair parameters of the analogues with respect to the Huang structure, we show enhanced tip rotation from the base-pair axis and twist rotation from the helical axis for the 8-isopropylamino-2’-desoxyadénosine. 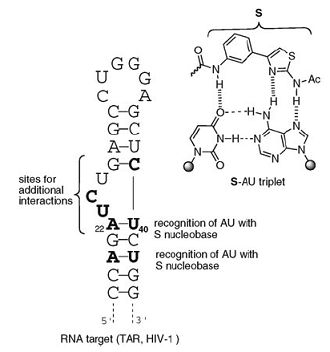 The time-dependent trace of the hydrogen bond distance between the DNA primer and the TTP as well as the mobility of the nucleosides reveal the breaking of the link, suggesting that the rotational shifts disrupt the normal base pair stacking necessary for transcription. On the other hand, adding a (CH2) group between NH and the dimethyl group in the 8-isobutylamino-2’-desoxyadénosine increase the flexibility of the adenosine analogue and compensate the rotational shift of the base pair, allowing a normal base pair stacking.